This time last year, I was mourning the loss of my dear friend and mentor, Charlotte, and making dinner for her family. Today I will be celebrating her life by baking the bread that she taught me how to make and taking it to someone in need. (Inspired by her equally wonderful daughter, Denise). This time last year N8tr0n's parents were visiting. Today I will be putting the finishing touches on the guest bedroom in preparation for their arrival here tomorrow! This time last year I was snacking on company cake. Today I will be making that same cake for some new friends that are coming over for dinner. This time last year we had no idea when N8tr0n would get a job. I was working as much as I could to keep our savings from completely dwindling. Today I sent N8tr0n off to work and said a prayer of thanks for his good job and steady income. This time last year we were trying to have a baby. Today nothing much has changed, except that I have a better doctor. And that I'm beginning to feel a bit apathetic about the whole ordeal. This time last year we were getting ready for a trip to Idaho. Today we live here, and we're loving it more everyday. Today the weather is supposed to be in the MID SIXTIES. Also, NO WIND—and if you live in Idaho, you know that last part is a really big deal. If you need us, we'll be at the park. All day. P.S. I'm back! I've missed you! Yay!!!! So glad you are back. You were missed. You've got a busy day today and this weekend. Have lots of fun and eat some extra cake for me. Crazy how life changes in just a year, isn't it? Sure glad most of it was for the better! Almost squealed with excitment seeing a new blog post from you, my friend. Loved this post. So fun to see how much can change in a year and how much we can grow. p.s. I love those tulips!! and your table. great picture. Hooray, you're back! I've missed your posts. Hard to believe it's been a year since you brought us dinner that night. I too will be making bread today and taking it to someone who could use a lift. It is so strengthening to know that many of us who love her will be serving in her honor. holy crap I've missed you too. I have had wild thoughts of packing all my kids in the car and driving to Idaho for spring break this past week. seriously. If only we weren't so blasted sick around here. I've got banana bread in the oven in honor of Charlotte right now. so glad you're back! i've missed your lovely posts. Welcome back! :) It is amazing to look back at how different our lives can be one year later. I love the idea of baking to honor someone special- filing it away for future use. Beautiful weather here today resulted in sunburn #1 of the year for the whole fam. Enjoy conference weekend! Cue: sigh of contentment. You were missed. It doesn't seem possible that is has been a full year since Mom's passing (and your fabulous dinner). And I love thinking about the nationwide Bread Brigade, baking to spread joy! I was so excited when I saw your blog updated in my GoogleReader! 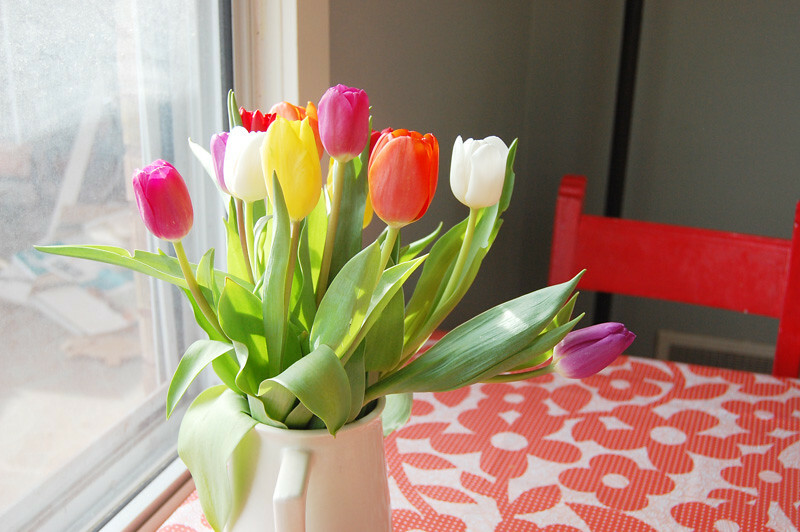 And I love love love those tulips.